How two credit unions' online, mobile, and app-based capabilities allow first contact and long-term relationship development without face-to-face interaction. Michigan State University Federal Credit Union and USAlliance Federal Credit Union both have tech-savvy fields of membership, long experience in bringing on new members online while holding down application abandonment rates, and established methods for following up on that initial experience. Now, both are rolling out new ways to join via mobile. As the largest of all university-based credit unions, late summer is a peak season for new member onboarding at MSUFCU ($2.9B, East Lansing, MI). That’s when a new flock of Spartans make their way to the big East Lansing campus. Working with state of Michigan employees as a new SEG is also adding to the onboarding onslaught. Good thing the credit union makes it easy to engage with the institution. New MSUFCU members can open and fund checking accounts and apply for Visa cards online , and once they’re members, they can apply for any loan product online, from signature loans to mortgages. But for MSUFCU, signing up new members online is old hat. The East Lansing-based credit union has been doing it since 2002 or 2003, says president/CEO April Clobes. From Jan. 1 to May 30 of this year alone members opened 962 accounts online, representing approximately one-third of all new accounts. According to Clobes, members opened 3,762 accounts online in 2014. That’s approximately 900 more than two years earlier. Despite the growing popularity of online account opening, in-branch account openings still represent about 70% of new accounts. MSUFCU staff uses iPads to sign up new members during SEG events, but member-facing online account opening is only available through the website. That means members must currently go online through all devices, but the credit union’s in-house development team is working on the custom code needed to add account opening functionality to MSUFCU’s mobile apps. We have an outbound calling team in our member relations group that focuses on abandoned new member and loan applications. The credit union is focused on keeping a consistent experience, look, and feel regardless of where a member opens an account, but there are inherent challenges in electronic account opening, including prospective members hitting the “x” button and shutting it down mid-process. Less abandonment means more engagement. And at MSUFCU, high-touch joins high-tech in increasing engagement. Follow-up processes are in place for members who don’t abandon ship, too, of course. That includes targeted cross-selling and general inquiries about member satisfaction with their new credit union and its service. The credit union makes calls or sends emails — which the member chooses — one week and then two months later. It follows those with customized marketing campaigns at the six-month mark. Perhaps surprisingly, the best response often comes from snail mail. USAlliance ($1.01B, Rye, NY) is a new member of the billion-dollar club, but the credit union is already making its mark. According to data from Callahan & Associates, it posted member growth of 17.48% in the first quarter of 2015, triple that of the average credit union of more than $1 billion in assets. The institution — which began more than 40 years ago in a basement cafeteria at pioneering tech giant IBM — has members worldwide and a network of 22 branches in New York, New Jersey, and Massachusetts. New members can join online at a screen that also offers the option of continuing an incomplete application — just one tactic that defeats application abandonment. 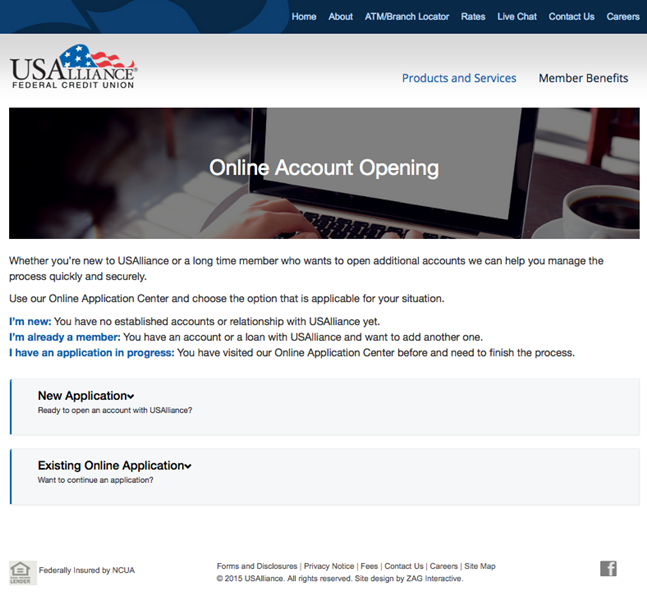 USAlliance is now rolling out native app account opening as part of what SVP/CIO Kevin Randall calls the credit union’s “mobile-first strategy." Working with mobile technology provider Gro, the credit union has made Android and Apple versions available to members after select employees tested them earlier this year. The apps include advanced features aimed at reducing the “keystrokes” users have to make on their small-screen devices. The process — through the mobile app or with a member service rep wielding an iPad at a branch — should only take three or four minutes, Kenworthy says. Once they’re signed up, USAlliance also has designated staffers in its onboarding business area who contact the new members. 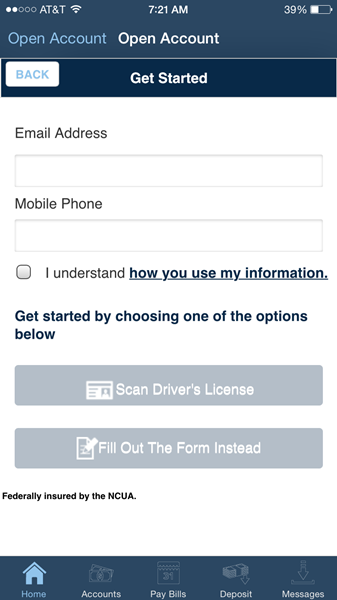 The mobile app view of the add account function from USAlliance Federal Credit Union. 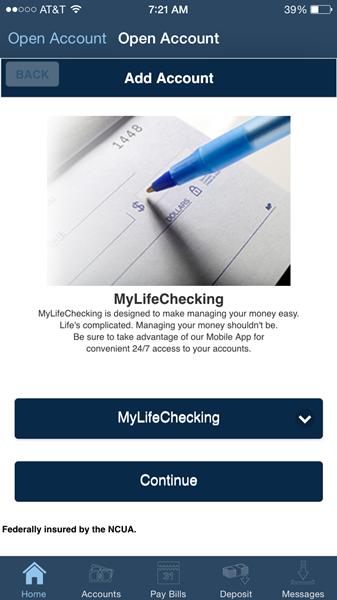 The view new members see when they open an account at USAlliance Federal Credit Union through their smartphone. Randall says new members – especially younger ones — expect to do everything mobile, including joining a credit union. “It’s just a given now,” the USAlliance CIO says. So is the need to make it all work smoothly.